In the not-too-distant future, consumers may be conducting a lot of Internet searches from their hands-free, voice-activated in-car technology centers - and not from their phones while driving. Maybe you think this might be a little to Star Trekish, but did many people think we'd be searching for things from cell phones not too long ago ? The car search technology is coming and it's not too soon for Rainmakers start thinking about how it will change their businesses. 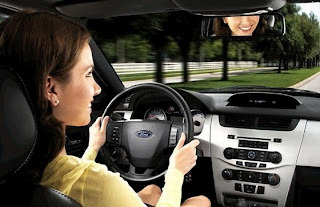 Consider Ford Sync, as one car manufacturer's example of what is to come. Once cars have cellular antennas built in, it's just a matter of time before we start using voice recognition for more than GPS and cell connections for more than voice calls. You could probably send a text by speaking and that would be a great relief against texting and driving. With onboard car computers, you probably would be able to start your car from your computer to warm it up or cool it down before you get in. If you run a retail store or restaurant, you've probably seen how mobile marketing might work for you. In fact, if you are located in a large city, it is already a part of how customers make their decisions. They walk around with their mobile phones and they decide how to get what they want. But in the suburbs, mobile marketing doesn't have the same impact. Consumers are more likely to use their computers to decide where to go before they get in the car. In-car technology might change that. Not that long ago, we went from using paper maps to using services like Mapquest to print out the directions before we left. Now, all we need is the address to put into the GPS systems. Once our cars are online, you should expect us to begin getting into our cars before we even know the address. We might have only a search query in mind. We'll use voice recognition to speak our search and the results will pop up on the display. Maybe they'll even be spoken to us so we can verbally choose which one we want. Our results will be ordered by proximity as well as relevance, not unlike how Google Local Search is beginning to work now. Perhaps it will also favor drive-thru locations. And when we choose our favorite, we'll be able request to transfer the address to our GPS system so that we get turn-by-turn directions. We might even be able to place an order to be picked up when we arrive. Wouldn't that be cool ? In some ways this will be a gradual change, since people already execute searches from their cars now, but they use their phones. In-car technology should be safer than peeking at our iPhones while driving, but there will probably be a lot of automotive industry regulation hurdles to surpass before we see wide adoption.